President Donald Trump says he is postponing his State of the Union address until after “the Shutdown is over,” following a standoff with House Speaker Nancy Pelosi. Pelosi had asked Trump to delay the speech until after the shutdown, but the White House tried to ignore the request, announcing Trump would move forward with the Jan. 29 date. But Pelosi blocked the move, telling the White House earlier Wednesday that the House would not approve a resolution allowing Trump to address a joint session of Congress. Republicans are blasting House Speaker Nancy Pelosi’s decision to block President Donald Trump from delivering his State of the Union address to a joint session of Congress because of the government shutdown. Pelosi told Trump Wednesday the House won’t approve a resolution allowing him to come until the government reopens. President Donald Trump says he will do an “alternative” event since House Speaker Nancy Pelosi has blocked him from giving his State of the Union address to a joint session of Congress while the government remains partially shut down. The California Democrat told Trump in a letter Wednesday the Democratic-controlled House won’t pass the required measure for him to give the nationally televised speech from the House floor on Tuesday. Trump said he was planning a “really important speech” and called Pelosi’s move a “great blotch on the country that we all love.” He argued Pelosi was blocking him because she doesn’t want to hear “the truth” about border security. President Donald Trump says he is not surprised about House Speaker Nancy Pelosi officially postponing his State of the Union address to a joint session of Congress until the government is fully reopened. Trump was asked about Pelosi’s action during a health care event at the White House and as the government shutdown extended into a second month. The stalemate over funding a U.S.-Mexico border wall has produced the longest partial government shutdown in U.S. history. Trump wants to deliver the speech Tuesday as planned. 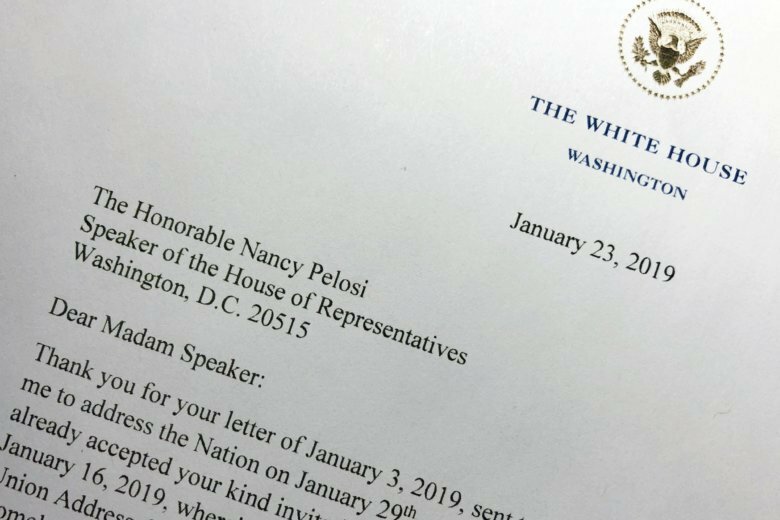 House Speaker Nancy Pelosi is officially postponing President Donald Trump’s State of the Union address until the government is fully reopened. The California Democrat told Trump in a letter Wednesday the Democratic-controlled House won’t pass the required measure for him to give the nationally televised speech from the House floor. Pelosi acted just hours after Trump notified her that he was planning to deliver the speech next Tuesday in line with her original invitation. Pelosi’s moves have left the White House scrambling to devise an alternative plan for the speech, which is one of the president’s top opportunities to lay out his agenda to the public. President Donald Trump says he is planning to deliver his State of the Union address next week in front of a joint session of Congress — despite House Speaker Nancy Pelosi’s request that he delay. Trump adds that it would be “so very sad” for the country if the address is not given as planned on Jan. 29. Pelosi last week cited the impact of the ongoing shutdown on the Department of Homeland Security and the U.S. Secret Service. Homeland Security Secretary Kirstjen Nielsen said the agencies were prepared to support the speech. The White House is proceeding with plans for President Donald Trump to deliver his State of the Union speech in front of a joint session of Congress on Tuesday without knowing whether Democrats will let him have that stage. Trump spokeswoman Sarah Huckabee Sanders, even as officials continued to work on a backup plan to have the president speak somewhere else. The White House emailed the House sergeant-at-arms asking to schedule a walk-through in anticipation of the speech, according to a White House official who was not authorized to discuss the planning publicly and spoke on condition of anonymity. The move is the latest in a game of brinkmanship between Trump and the House speaker as they remain locked in an increasingly personal standoff over Trump’s demand for border wall money that has forced a partial government shutdown that is now in its second month. The president cannot speak in front of a joint session of Congress without both chambers’ explicit permission.